In order to further the international prestige and to boost the economy of Mordan, we are in favour of organizing great sport events. Earlier we proposed the Lagrangian Games and the Mordan Open. In this post several proposals for a Turo di Mordano. A similar format as the Tour de France, but then on inline skates rather than on bicycles. O’Neill cylinders are designed to be 32 to 35 kilometers long and are divided in three valleys separated by windows. This will allow for stages up to 105 kilometers by making a “S” by using the hemispherical poles. In this proposal there will be about twenty stages, and the participants will have to join a team. Ideally there will be both a race for both men and women. Though one might think that road cycle racers would compete individually, all participants of the Grand Tours (i.e. the Giro d’Italia, the Tour de France, the Vuelta a España) are part of a team (usually named after the team’s sponsor). In order to bolster the idea of cycle racing as a team sport, it is an idea to organize a multi-stage race with tandems. Tandems are bicycles for multiple persons, usually in a row. Most tandems are designed for two people, but there also tandems for three or more people. One tandem has even as much as ten seats. In one version of this proposal, we could use two-person tandems. Further we could require that each tandem is powered by a female and a male racer. This would eliminate all concerns of gender inequality. In another version, four-person tandems are used. This creates an interesting possibility for changing the line up either by reordering the cyclists or to replace them (only between stages, not during one). This will make road cycle racing an even more tactical sport. Inside view of a Stanford torus. 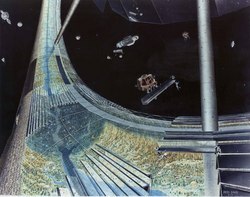 If great enough, a torus-shaped space habitat is suitable for long distance racing.